High quality dental treatment suction system provides the necessary conditions under which the dentist can work ergonomically and calmly without constant interruptions caused by the patient’s swallowing reflexes. And with the spray mist aspiration it makes an essential contribution to hygiene in the practice and protection against infection. 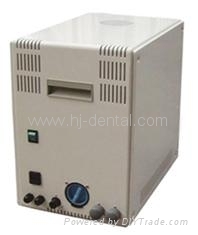 It must always provide full suction power despite having to contend with a permanent load of waste water, blood, saliva, dentin and a wide variety of filling materials (e.g. plastic, ceramic, amalgam, precious metals). Clearly, great demands are placed on the suction system in dental practice.